Sustainability applied to transportation and logistics systems is an area of innovative research that considers actions aimed at improving the economic, environmental and social performance of passenger and freight transport and logistics. 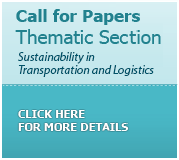 Sustainability applied to transportation and logistics systems is an area of innovative research that considers actions aimed at improving the economic, environmental and social performance of passenger and freight transport and logistics. Reducing the emission of atmospheric pollutants and greenhouse gases, noise and solid or liquid waste emitted by the transport sector (passenger and freight) and logistic operations, with consequent impacts on human health and the environment. Production Journal is a scholarly publication that aims to foster knowledge creation and dissemination. 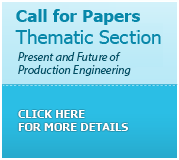 The thematic section guest editor invites scientists, engineers and decision makers from government, industry and academia to contribute with research papers. The manuscripts must present well-described background; clear aims; robust methods; well-presented and thoughtfully discussed results, with an original and relevant theoretical, empirical and/or methodological contribution. For author guidelines, please refer to www.prod.org.br. A detailed cover letter must be submitted, in which authors highlight the manuscript adherence to the Editorial scope of the journal, theoretical and practical relevance, aims, methods, main results and its original theoretical, empirical and/or methodological contribution.